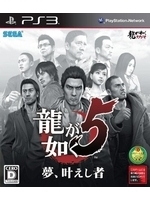 Finally the wait is over, Yakuza 5 is officially available for PS3 in North America and EMEA territories. Launch trailer inside. Earlier this weekend, SEGA revealed that Yakuza 0 will also get a Western release, therefore the wait for this one won't be too long. So good. Could only play a little yesterday and also have plans this evening unfortunately but what I did play felt vastly improved over Yakuza 4 in every aspect. These guys turn up every game.